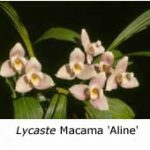 Lycaste is an orchid genus named after the beautiful daughter of King Priam and Queen Hecuba of Troy, and was first named by John Lindley in 1843. It is represented by about fifty species that are found from Mexico to Peru. These are both epiphytic and lithophytic and grow under cool to intermediate glasshouse conditions, depending on the particular species. Lycastes range from being fully deciduous each year to retaining their leaves for 18-20 months, and require a rest period during the winter prior to flowering and recommencement of their growth cycle in spring. Lycaste plants are characterised by large pseudobulbs that support two to four large ribbed leaves. Flowers arise singly from the base of the pseudobulb and are long lasting, four to eight weeks being common. There is occasionally an autumn flowering from the old pseudobulb but the main flowering occurs in the spring. Generally one flower of excellent quality develops first from the base of the newest pseudobulb and this is followed by the spring flush. From three to five flowers per pseudobulb are usual, especially for hybrids bred from Lycaste skinneri but 30+ flowers over a period are possible from the deciduous species and their hybrids. The flowers are characterised by having three prominent sepals that open flat and often reflex at their tips. These sepals may have the spatial arrangement of an equilateral triangle or tend more to an inverted T. The petals are lesser segments that typically envelop the column; the labellum is also generally small. Colours are commonly in the yellow-brown-orange range and often there is a marked contrast between the segments. Pinks and whites are represented by Lycaste skinneri and green by Lycaste locusta. 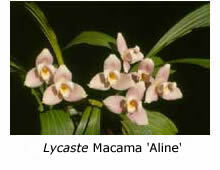 The genus Lycaste is related to Anguloa, Batemannia, Bifrenaria and Xylobium, and hybridises freely with them. Angulocaste and Lycasteria are the most common intergeneric hybrids. Lycaste has been extensively hybridised within itself, Lycaste skinneri being the dominant species used. Lycastes respond well to good culture, and indeed this is essential for best results. They are best grown in a cool intermediate glasshouse at a minimum temperature of 8-10°C, although cymbidium conditions in a fully enclosed glasshouse during winter are satisfactory. Adequate sunlight, water and feeding during the growing season, coupled with moderate humidity and constant air circulation, will allow for the development of the large pseudobulbs necessary for top flower production. During winter maintain a relatively high light intensity but decrease the frequency of watering and fertilising. Appropriate watering throughout the year is essential. Copious amounts are required during the growing season together with the application of a balanced fertiliser. At maturation of the pseudobulbs (when the small sheathing bracts turn brown and fall off) decrease the frequency of watering considerably for those species that retain their leaves. Water may be almost completely withheld from the deciduous ones until their flowers or new growths appear. Mature pseudobulbs may be allowed to approach the stage of wrinkling to create stress and thus initiate flower production. However, do not allow excessive wrinkling to occur. Seedlings should be kept moist at all times. It’s preferable to water directly into the pot, rather than over the leaves or into the new growths. 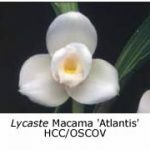 Lycastes are especially sensitive to chlorine, so avoid the use of highly chlorinated tap water. Lycastes are best grown in black plastic pots that have excellent drainage. The compost must be free draining yet be able to retain adequate moisture and nutrients to supply the plant. A good quality cymbidium compost is ideal. Repotting is done in spring, after the plant has flowered and when the new growths have become established. Repot before the plant outgrows its container, leaving two or three pseudobulbs and the new growth on the leading part of the plant. Lycaste skinneri and hybrids in which this species is dominant are best grown in pots. Backbulb propagations may be attempted but leave at least two pseudobulbs attached to each other. If the plant loses its roots or shows signs of dehydration, transfer it to Sphagnum moss to re-establish a root system before returning it to the growing compost. 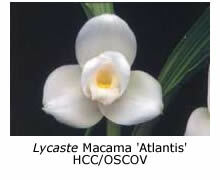 Lycastes are subject to the same pests and diseases that trouble other orchid genera. Virus disease, rots and the cosmopolitan pests may all cause trouble and their rapid diagnosis and effective treatment, together with an environment that limits their occurrence, is essential. Of special concern are rots, e.g. Erwinia, that affect the pseudobulbs, and scale, which can occur in heavy infestations all over the plant. Ants often draw attention to the presence of scale. Lycaste aromatica. Found from Mexico to Guatemala, this species is both epiphytic and lithophytic. It is deciduous and very floriferous, bearing up to 18 flowers per pseudobulb. These appear in spring immediately prior to the appearance of the new growth. The flowers are fragrant, the sepals and petals green-yellow and the labellum and column bright orange-yellow. This species is ideal for specimen culture. It requires cool intermediate conditions for optimal growth.